You say dirt-man and a rib transplant outside the Garden of Eden, I say ancient man copulating with sugarcane. "In the beginning, on the island of New Guinea, where sugarcane was domesticated some 10,000 years ago, people picked cane and ate it raw, chewing a stem until the taste hit their tongue like a starburst. A kind of elixir, a cure for every ailment, an answer for every mood, sugar featured prominently in ancient New Guinean myths. In one the first man makes love to a stalk of cane, yielding the human race. At religious ceremonies priests sipped sugar water from coconut shells, a beverage since replaced in sacred ceremonies with cans of Coke." (Rich Cohen, "Sugar Love (A not so sweet story)", 82 and 86). According to D.C. Gajdusek, the Simbari-Anga of Papua New Guinea "have a creation myth in which the progenitress of their people planted sugar cane from which sprang males who proved to be unsatisfactory consorts for her; these were all kwalatmala. She then planted a red variety of sugar cane from which sprang real men with large penises." ("Urgent opportunistic observations,"89). The kwalatmala in their contemporary society are pseudohermaphroditic males. 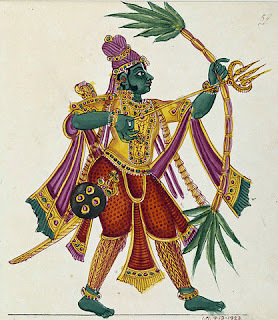 The Hindu god Kāmadeva has a bow made of sugarcane and flower arrows, which sounds tastier and prettier than Isaiah's vision of turning weapons into farming implements. (Catherine Benton, God of Desire: Tales of Kāmadeva in Sanskrit Story Literature, 16, 24, and 128). The prominence of sugarcane in some of these myths calls to mind the importance of maize in Maya myth. Just an interesting reminder of the ways in which myths reflect the cultures that birth them, including that culture's most important crops.